State Building Maintenance Limited incorporates a set of standards and protections when hiring our cleaning staff such that our customers can be confident that all our staff are professionally trained in the latest janitorial cleaning methods and tools by our company. Newly hired janitors that may come to us from another Toronto cleaning company often feel that they have the knowledge to immediately handle a new job but we re-teach as we have a proven track record of effective business and home cleaning methods. Our loyal and satisfied customers will attest to our first-rate processes and professionalism.So initially when a new janitor comes to us we work along with them for several nights, teaching and changing, if necessary, their previous cleaning methods. We instruct them on the correct usage of cleaning solutions, our system of restocking and date stamping supplies, the technique, and there is a technique, on working with our cleaning equipment, and something as simple but important, on which lights need to be left on/off when leaving an office. Our supervisors will also do on the spot checks and they are always on call to handle further questions from our employees or lend a hand. Our employees are also instructed to call us immediately if they come upon any problems such as plumbing etc. They must also notify us in advance when our company needs to bring in additional cleaning supplies. We retrain when introducing new janitorial equipment and solutions. Our customers place great trust in us to care for their place of business, be it a Toronto office or factory, it is our responsibility to put an inordinate emphasis on protecting their premises, so State Building Maintenance Limited teach our cleaners on the proper procedure of opening and closing an office/ building, most often working with alarm systems. Only when we are completely satisfied with their working knowledge do we turn over the keys. When a Toronto, Vaughan, Markham, Mississauga cleaning company sub-contracts, and many do, they do not necessarily know the quality of work or the character of the company they are hiring, they may not have had the proper training so may not perform as expected. Our janitorial company has the expertise to tackle the many jobs required in commercial and janitorial cleaning, be it for general offices, industrial, condominium or retail cleaning, so STATE BUILDING MAINTENANCE LIMITED DOES NOT SUB-CONTRACT. It is also of the utmost importance that our commercial and janitorial cleaning services company protect our invaluable full and part-time employees, some of whom have worked with us until they have retired. State Building Maintenance Limited is registered with WSIB, the Workplace Safety Insurance Board that states it “administers compensation and no-fault insurance for Ontario workplaces”. This insurance gives peace of mind to our cleaners as it provides lost wages to employees injured on the job and added protection to the company they work for. To further protect our janitorial staff, we supply them with PPE, personal protection equipment. How they are protected and what they are supplied with depends on the facility and area they are working in. For general commercial cleaning, they are supplied with gloves and masks and easy to use portable carts for less strain when gathering garbage. For industrial, manufacturing or warehouse jobs, in addition, we also provide our staff with safety glasses, hard-toed work shoes and safety vests and at times they must wear hard hats. We are also certified members of WHMIS, the Workplace Hazardous Material Information Systems. This is a government course we have taken to ensure the health and safety of our employees and the companies we work for. Our suppliers must classify all their products according to hazard and label all solutions as to their use along with warning labels. They must also make available Material Safety Data Sheets, MSDS, on all products we order. These sheets are put into the Janitor Supply Room so in the event of an emergency the MSDS will be provided to a Doctor. We also provide these information sheets to our customers so they have data on each product that we regularly use. We also spend additional time to make sure that our employees, whose first language is not English, can understand signage and follow through on our rules when working with solutions and equipment. To give further assurance to our clients we are bonded and insured. In a cleaning business, a bond represents a form of insurance that protects against theft and damage. State Building Maintenance Limited carries Liability Insurance, a Dishonesty Bond and Key Loss Insurance so as to remain dependable in the eyes of our customers. State Building Maintenance Limited, proudly serving our customers since 1963, is here to stay and WE DO IT ALL, so please check out our Janitorial page as to all the services that we can offer your company. Finding the right janitorial service is a very important decision for your business. It’s important to ask the right questions when you are speaking with prospective commercial cleaning companies. Maintaining a sanitary and clean work environment is essential to the success of your business. First impressions are extremely important in business and a messy or dirty building can instantly create a negative experience for customers, tenants and employees. Having clean spaces will create an instant positive reaction and will improve your building’s appearance and hygiene. Let’s be honest, it can be hard to maintain a clean building with so many other tasks on your daily to-do list. Many companies find it to be more cost effective to hire an outside commercial cleaning company to handle their ongoing and seasonal cleaning needs instead of adding a full-time janitor to their payroll. There are many commercial cleaning companies throughout Toronto, Vaughan, Markham and Mississauga that offer janitorial services. Finding the right janitorial service for your business can not only keep your workplace clean, it can save your company a lot of money and stress. Outsourcing your cleaning needs to a Vaughan, Markham cleaning company will allow your employees the ability to focus on their actual jobs. Cleaning chemicals can be hazardous when they are not used properly. An experienced commercial cleaning company will be trained and certified to use these chemicals, products and equipment needed to clean your space properly. This will not only ensure the job is done properly but will protect you and your staff from any unfortunate hazards involving cleaning products. Ideally, you will want to hire a janitorial company that utilizes the right equipment and tools to do the job properly. Also, experience in office space cleaning is a key thing to seek in a janitorial company. You’ll want a partner who operates with quiet cleaning equipment, allowing your business to function as usual while the cleaning is taking place during the daytime and/or the night time. Professionalism is a must-have for any janitorial cleaning service you hire. You need your workplace cleaned to the highest standard in a timely fashion. An experienced commercial cleaning company will provide a level of professionalism that you and your business can count on. A clean building is essential to your business so you need your cleaning company to have a strong attention to detail, allowing you and your team the ability to focus on your day-to-day tasks. Any experienced janitorial company should be able to quickly provide you with a list of references. It’s important to ask and verify the work of any cleaning company that you are thinking about hiring. Experience is also another important element to consider. Since 1963, State Building Maintenance Limited (SBML) has been supplying office cleaning services in Toronto, Markham, Vaughan, Mississauga, Brampton, Richmond Hill, Thornhill, Scarborough and throughout the GTA. Experience also allows our professional cleaners the ability to have a deep understanding of their craft. At SBML we do our job efficiently the first time, making your workplace sparkle until the next visit. It’s important to work with your janitorial service to come up with an action plan that’s customized for your business’ needs and schedule. We will work with you to address your company’s unique cleaning requirements. We’ll target your troublesome and high-traffic areas and design a plan that will best keep your space clean for the long term. A strong office janitorial plan will keep your space clean and will save you money by optimizing cleaning time. Services are scheduled based on your company’s operational schedule, budget, and seasonal needs. We have your business janitorial needs covered, our clients include corporate offices, commercial properties, high-rise office buildings, industrial properties, condominiums, retail outlets and office spaces of all sizes. We take a lot of pride in our ability to exceed the expectations of our clients throughout Markham, Vaughan and Toronto with our janitorial services. We’re proud of the reputation we earned over the years and our experienced cleaning team take this experience with them to every cleaning job we do. Looking for the right janitorial service partner? Contact us today for a free quote at info@sbml.ca or call us at 416-247-1290 and learn how SBML can keep your building sparkling. Spring is a time for birth, rebirth and renewal, it is also that time of year, after many sunless, gloomy days of winter, when businesses get their verve back and start focusing on bringing in new customers. And it is also that time of year when, as the sun pours through our windows, that we notice some of winter’s damage. From experience, State Building Maintenance Limited recognizes that no matter what your daily office cleaning program entails, winter is the hardest on all flooring materials, whether you are talking about carpets or hard surfaced floors such as marble or man-made tiles. No matter how diligent an office cleaning company is when taking care of your carpets and floors, by the nightly vacuuming of carpets and mats and sweeping and damp mopping of flooring, customers and staff do bring in damaging grit. These tiny pieces of winter road salt, miniscule gravel, de-icers etc. adhere to your footwear, are then carried into your offices and become deeply imbedded in your carpets. If they are not vacuumed up daily because your cleaning program may different from a five-day a week cleaning schedule, these tiny pieces can then, on carpets, cut open the looped fibres of carpets and shred twisted fibre carpets, so it is imperative to remove all these destructive particles before they are trampled down even further into your carpets. So, for those customers who are not on a daily vacuuming schedule, we suggest that at winter’s end a deep, deep vacuuming be done with a heavy duty, strong suctioned vacuum that has an agitator, to bring to the surface all these granules. This may even require a second deep vacuuming to protect your expensive investment. And as part of our spring office cleaning program State Building Maintenance Limited will then do a rotary cleaning, a steam cleaning and a deodorizing of your carpets. Our customers who are on an “every three months’ carpet maintenance program” with State Building Maintenance Limited are delighted at how effectively we can maintain the original colour of your carpets no matter how harsh the winter. After State Building Maintenance Limited has taken over a new customer’s carpet maintenance program, because of ineffective carpet cleaning by other cleaning companies, our new customers are pleasantly surprised when we have often brought back the original colour of their carpets. It is important to handle winter’s damage before we head into the summer months. These same destructive pieces of grit will cause even more noticeable damage to your hard-surfaced floors. To help stop the etching of your floors, State Building Maintenance Limited recommends, throughout all seasons, a daily sweeping with a treated sweeping tool and a damp mopping or floor steaming. Unfortunately, as we are often not there throughout the day to stop the grinding in of these granules, damage will occur during working hours. So beyond our nightly floor sweeping and damp mopping, we will shield your flooring throughout the year by putting down protective finishes and perform a buffing as needed. But in time all floors will need to be stripped to prevent a build-up of floor finishes. State Building Maintenance Limited suggests to all businesses, whether they be commercial, industrial, retail or condominiums, that spring is the perfect time to refurbish your floors. State Building Maintenance Limited will strip your floors and put down a floor finish that is the appropriate impregnator and/or sealer for your type of flooring and if requested, provide our first-rate floor maintenance program, taking into account your needs and budget. In some cases, because of heavy foot traffic, customers may choose to set up several floor stripping’s and refinishing’s throughout the year along with a daily, bi-weekly or a weekly maintenance program. We will be pleased to come in and undertake a one time, spring floor refinishing or set up a complete office cleaning and janitorial program per your requirements. State Building Maintenance Limited, known for their effective, efficient and reliable staff, are insured and bonded and members of WHMIS. WE DO IT ALL, so whether you need a steam cleaning of your carpets or a stripping, buffing or burnishing of your floors, a full WINDOW CLEANING, an EVENT CLEAN-UP, CONDOMIUM, MANUFACTURING OR WAREHOUSE CLEANS, please call STATE BUILDING MAINTENANCE LIMITED at 416-247-1290 or email us at info@sbml.ca for a free quote. As in January, State Building Maintenance Limited is continuing its discussion of various types of flooring and their cleaning requirements. For those who are considering a new floor installation we recommend that you discuss the merits of your floor choice and definitely the cons with the manufacturer if possible, the seller, your installer and your contractor if you are using one. Many people regard these products as interchangeable – they are not – there is a major difference for the usage of each product. State Building Maintenance Limited believes an impregnator is essential for all porous flooring. The purpose of an impregnator is to penetrate into porous flooring, inside the actual product. They essentially help to prevent water, dirt and oil from going INTO porous flooring, as DEEP stains are almost impossible to remove, if at all. What they do is give you time to clean up a spill so there is no DEEP staining. They do not provide 100% protection, they will not prevent acidic etching nor do they last forever. If used by experts they do not change the texture or appearance of your flooring. They are NOT a surface protector. So where does a sealant / topical sealer factor in? These sealers are your surface protectors, we also consider this product essential. They are the second step in protecting porous material but also the first step in providing added protection for non-porous flooring. 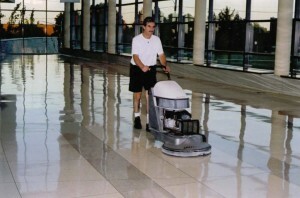 They add surface protection from water, dirt and oils and make for easier daily floor cleaning and buffing. They can change the look of your flooring depending on the sealer, on whether you chose a mat, semi-gloss or a high gloss sealer. Their disadvantage is that they do wear, more so in high traffic areas. When that occurs State Building Maintenance Limited will strip and re-apply the sealer. We know it seems as if there is no end to floor maintenance and we have to agree but what our customers need to know is that it is our company’s job, working with pride, to protect your investment. Buying and installing Granite as a floor choice can prove to be an expensive option. There are different qualities/grades of Granite. Low-priced Granite will generally have faults in the stone and can be a thinner tile, therefore weakening it. Although costly we recommend premium or first grade Granite for its strength, so the utmost protection is imperative. An impregnator is recommended to protect your Granite from deep staining. After that application a sealant should be applied for further protection and then re-applied as needed. For commercial spaces, to keep your sealed Granite looking its best, State Building Maintenance Limited recommends a daily sweeping with a treated sweeping tool and then a light washing. As with other natural stones Slate comes in a variety of colours but is mostly chosen and known for its rich shades of black and grey, providing a rustic look, but when paired with popular paint colours and brilliant silver decor it gives Slate a modern look. Because Slate is formed by the earth’s pressure of its stone layers it is crucial to lay Slate on an even subfloor or it may crack. Slate is a highly durable tile but because of the way it is formed surface layers have been known to flake off. So State Building Maintenance Limited advises our customers to apply an impregnator that will settle into the stone and then a sealant as further protection, with the sealant being re-applied when necessary. Daily care necessitates a sweeping and a light washing. Many consider Travertine to be a soft stone as it is a porous stone peppered with holes. Because of this it will absorb moisture easily, is prone to staining, can be scratched and show its wear and tear but don’t let that stop you from installing this attractive stone that has been used for centuries. If you are looking for warm tones in your flooring Travertine may be the answer, available in tones of beige, rust, tan, and brown. Some people prefer the unsealed, old tumbled look of Travertine and are willing to accept staining but as it can be greatly affected by moisture and acidic products, for businesses State Building Maintenance Limited definitely recommends that initially an impregnator be applied and then a sealant as a second line of defense. Once sealed we can maintain your Travertine tiles, keeping them looking their best, as we do with other natural stones, utilizing State Building Maintenance’s daily cleaning routine. Terrazzo is a solid surface, extremely durable material, invented in the 15th century. It was originally made by combining cement and marble fragments. Nowadays Terrazzo is still manufactured from cement but can also be prepared with an epoxy base. What makes Terrazzo so versatile is that we can now add glass, metallics and other aggregates to create a custom look. This tough solid surface material, polished to a high shine and with no grout lines requires less time consuming maintenance, an added bonus when working out your yearly maintenance budget, but it can be slippery when wet so State Building Maintenance Limited recommends a non-slip coating be applied to its surface. As with other flooring it will require a daily sweeping and then a light washing when necessary. Vinyl Flooring comes in an array of colours and patterns, copying the look of wood flooring and many expensive stones, so if it is not in your budget for the original, Vinyl flooring may be the answer. Buying the highest quality of Vinyl flooring will come with a warrantee of 15 years or more. For added protection State Building Maintenance Limited will apply a 25% acrylic floor finish. Although not the first choice for offices, you will still find the top rated Vinyl flooring in many offices but there is one limitation, Vinyl flooring can be gouged and cut so you must not push your office furniture over the surface of Vinyl flooring without using protection. Using furniture gliders or soft furniture pads is a must. To keep its appearance Vinyl flooring just needs to be swept and damp mopped daily. State Building Maintenance Limited can also PROPANE BURNISH VINYL FLOORS to create a very high shine, that wet look. You will find Concrete flooring in all our customers’ factories and warehouses because of its durability. It takes tremendous weight to damage Concrete, it will easily handle the weight of manufacturing machinery, the weight of your products piled high and the weight of trucks and forklifts that need to enter your premises. We at State Building Maintenance Limited recommend a daily sweeping of Concrete with a dust inhibitor and then a light washing, daily or monthly, depending on our customer’s requirements. In places where Concrete flooring is your show piece, being used now more than ever, and because Concrete is a porous material State Building Maintenance Limited recommends the use of an impregnator and then a sealant to help prevent staining. As concrete too is considered a solid surface material, once polished to a smooth finish and sealed properly it just requires a daily sweeping with a dust inhibitor and a light washing as needed. Having read the above article it may dissuade some customers from purchasing their first choice of flooring for a future renovation but remember no one floor product is the perfect answer, not even solid surface materials like polished and sealed Concrete or Terrazzo. With a solid surface material, if there is major damage, and we are not saying it will happen, the repair to solid surface materials can be more costly than lifting and replacing a few tiles. Although there is no one perfect flooring, STATE BUILDING MAINTENANCE LIMITED is your perfect answer to your flooring’s upkeep. State Building Maintenance Limited has kept pace with the cleaning practices of all floor surfaces, old and new, we have the expertise, are trustworthy and efficient but more than anything, our aim is to provide complete satisfaction with our cleaning services. Many businesses, having closed their books for the year 2016, are looking at 2017 as a fresh start. With that new beginning there may be an allotted amount in your yearly budget for building/office renovations. So to get the best return on your investment owners will choose the renovation that not only adds to the value of the building/office but also conveys that wow factor/that pleasing and inviting look for their customers and staff. In State Building Maintenance’s experience, providing you don’t need new mechanics in the building such as fixing plumbing problems etc., we see that one of the most positive impressions and impact on customers is made by renovating the front entrance/lobby. As compared to an entrance that is dark and dingy, entering a new and glistening entrance hall/reception area can’t help but perk up one’s staff and visitors. But we find the most lasting and positive impression is created by the renovation of your washrooms. No business owner wants to feel that their customers/employees are rushing in and out in order to avoid what looks like a dirty washroom but upon reflection it may just be dated with worn/cracked tiles and grout that can no longer be cleaned because it was not maintained or sealed properly when installed. So to help with your renovations of 2017 State Building Maintenance Limited will talk about different tiles/flooring that we have worked with, their pros and cons, and ask you to do serious research before you make your choice for your particular renovation. MARBLE, we consider that the WOW factor, but an expensive WOW factor. Marble, one of the most strikingly veined, natural stones has been used in buildings for centuries and withstood the test of time but only with continuous maintenance. We deal with marble on many of our customer’s floors. You need to remember that marble is a soft, porous stone that is easily stained and scratched. But when laid properly and maintained with the help of State Building Maintenance Limited, marble suggests “splendour”. Marble must first be professionally sealed. Because of its porosity we recommend an impregnator, the correct one for your needs, which penetrates into the marble and then you will need the right cleaning and polishing program for maintenance. Do not apply a light sealer that will sit on the surface and wear off in next to no time. If properly sealed the correct finish will last many years. Maintenance will then be a daily wet mopping and a weekly buffing to enhance its shine. We then periodically, depending on the traffic and the way it was sealed, will reseal the tiles/sheeting. If serious damage occurs, other than normal wear and tear, you must bring in, with some expense, a stone restoration company. Over the last few years we have noticed that much of the new marble being chosen is lighter in tone then what was even chosen ten years ago. Many people confuse Porcelain tiles with Ceramic tiles. First we must say that Porcelain tiles are more often than not becoming the tile of choice for flooring, especially in HIGH TRAFFIC or WET AREAS. Porcelain tiles are the hardest commercially made floor tiles available and fired at a higher temperature than ceramic tiles. However the Tile Council of North American defines porcelain tiles not by their strength but by their water absorbency. Porcelain tiles absorb less than 0.5% whereas ceramic tiles absorb more than 0.5%. Full bodied/ homogeneous porcelain tiles, unglazed and unpolished, carry the colour and pattern throughout so that if there is any wear or chipping it is difficult to see. They offer slip resistance but can stain more easily. To some that dull look may be disappointing after installation so often State Building Maintenance Limited will get asked to put on a low gloss sealant to add some shine and a layer of protection. Porcelain tiles also come glazed with a layer of liquid glass, this provides better protection from staining but offers less slip resistance and will show more scratches. Having stressed the benefits of Porcelain tiles, there is nothing wrong with Ceramic tiles, they are in many of our customer’s entrances and washrooms. They are both manufactured from clays, kiln dried and come unglazed and glazed. They are a softer clay and as many will attest, are much easier to cut and install than porcelain. So bear that in mind as extra time in installing porcelain tiles may require more money in the budget for porcelain work. Coming in an array of colours and patterns, ceramic tiles are also usually a little less expensive. They, too, are often used in wet areas such a bathrooms, both on walls and floors, glazed tiles being recommended for walls to promote easy cleaning and protection from moisture and minimally glazed or textured tiles are recommended on washroom floors for slip resistance. Ceramic tiles, a little more prone to wear and tear and chipping, are generally rated from 1 to 5 so they are not recommend for high traffic areas unless you choose a tile with a rating of 5. It is buyer beware and the need of a knowledgeable supplier and installer. Ceramic tiles that come glazed only need a daily wet wiping/mopping. State Building Maintenance Limited recommends that our customers speak to a minimum of three companies about their tile products before making a final choice. So if you are ready for a new floor installation please call State Building Maintenance Limited and talk to us about what we have learned about the flooring of your choice and the maintenance that it really needs to keep that new look. Remember your contractor does not make the final decision, you do. All flooring is not created equal, speaking from experience the more information you have the better to make the right choice for you budget. At this time of year meteorologist often talk about a January thaw that comes when temperatures hit above the freezing point for a few days. This starts a quick melting process of snow and ice. So State Building Maintenance Limited wants to re-enforce the need for daily removal of all standing water on your tiles/flooring to prevent falls and to stop the growth of mold.